Friends, Thanksgiving is just around the corner. And as I finalize my menu, I am making sure to include plenty of recipes that not only taste fantastic, but are also quick, easy and hassle-free. 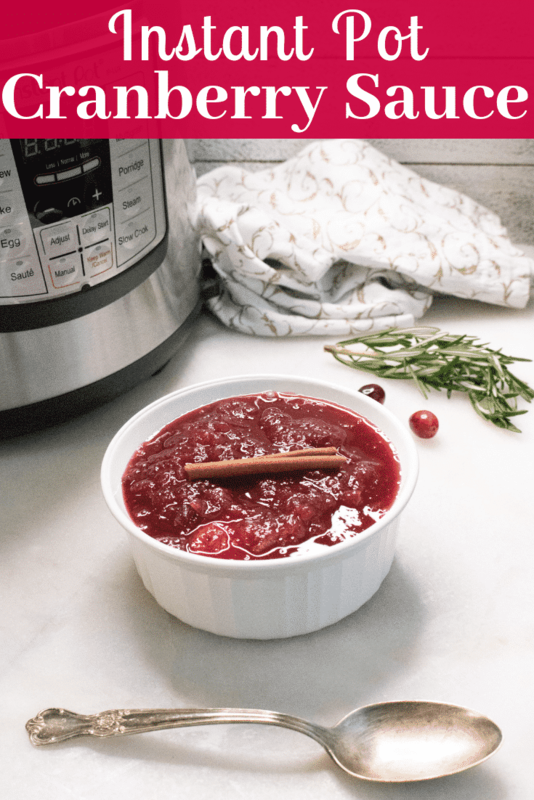 That is exactly why I am so excited about this recipe for Instant Pot Cranberry Sauce. It is so easy to put together: you simply add the ingredients to the Instant Pot, stir and set it. That’s all there is to it! It is also a perfect make-ahead item. And anything I can prep prior to the big day is a winner in my book. The turkey may be the star of the Thanksgiving table, but aren’t all the scrumptious sides that go with it what we all really love about Thanksgiving? And to me, Thanksgiving just isn’t Thanksgiving without cranberry sauce. As a kid, I never cared for cranberry sauce. Maybe because my mom bought that stuff in a can, that when dumped on a plate looked like a big blob of dark red, giggly gelatin that still had all the can indentations still in it. 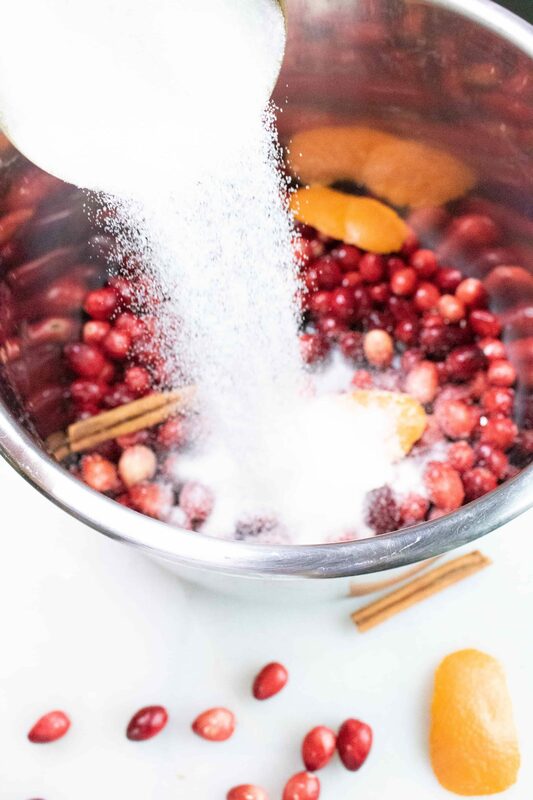 Luckily, when I discovered cranberry sauce made with fresh cranberries, like this recipe for Instant Pot Cranberry Sauce, my relationship with this side dish changed forever. The simple addition of cinnamon, lemon peel, and sugar almost makes you want to eat this for dessert instead of pumpkin pie. Almost. 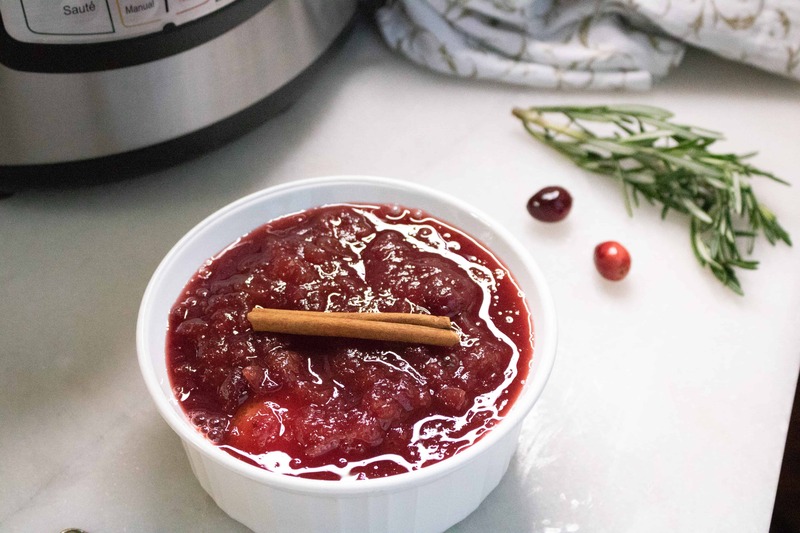 This recipe for Instant Pot Cranberry Sauce is totally addictive and totally delicious. Cranberries are native to North America. So, chances are you are “buying American” when you buy the cranberries for your Instant Pot Cranberry Sauce. Cranberries are about 90% water. Hmmm. So perhaps we could count the water in the cranberries of our Instant Pot Cranberry Sauce towards the crazy amount of H2O we are supposed to consume in a day. Kinda makes sense, right? You can store cranberries in the refrigerator for up to 1 month and in the freezer for up to 9 months. I always buy extra when I do my Thanksgiving shopping as cranberry sauce is one of my hubby’s all-time favorite treats. I freeze them and then surprise him the middle of spring with this yummy dish. It’s always a bit hit. Here are some additional recipes to help you think outside the box when it comes to Instant Pot Cranberry Sauce pairings. Why not pair the sweet & tangy taste of this cranberry sauce with this awesome recipe for Instant Pot Lemon Garlic Salmon for a fun twist. Or try it with Baked Pork Chops with Garlic and Broccoli. The flavors balance so well together! Chicken is so close to turkey it just makes sense to serve Instant Pot Cranberry Sauce the next time you roast the smaller bird for dinner. Try this recipe for Chicken with Garlic and Herbs. 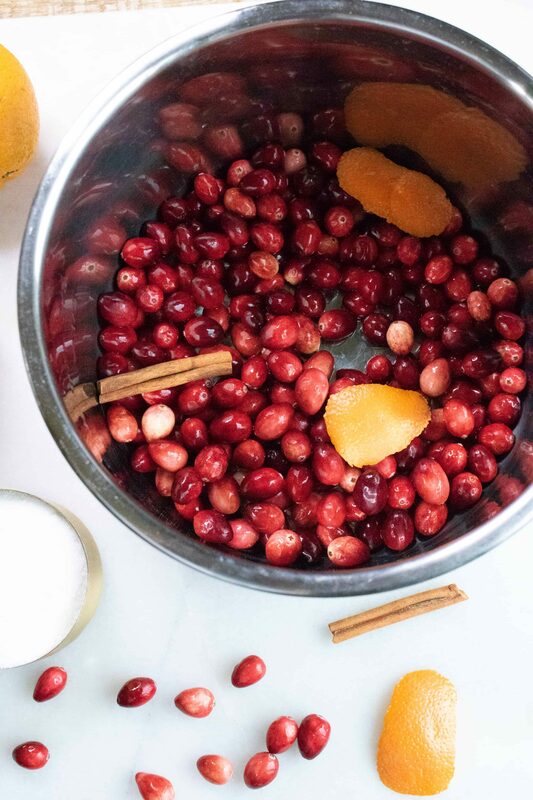 Step #1: Combine cranberries, cinnamon stick and orange peel in Instant Pot inner pot. Step #2: Add sugar to Instant Pot inner pot. Step #3: Close the Instant Pot lid and turn pressure valve to the sealing position. Step #4: Cook on manual high pressure for 6 minutes. Step #5: Allow for a Natural Pressure Release for 6 minutes, then perform a Quick Pressure Release to let the remaining pressure out. Step #6: Mash the cranberry sauce lightly before transferring to a serving dish. Enjoy! 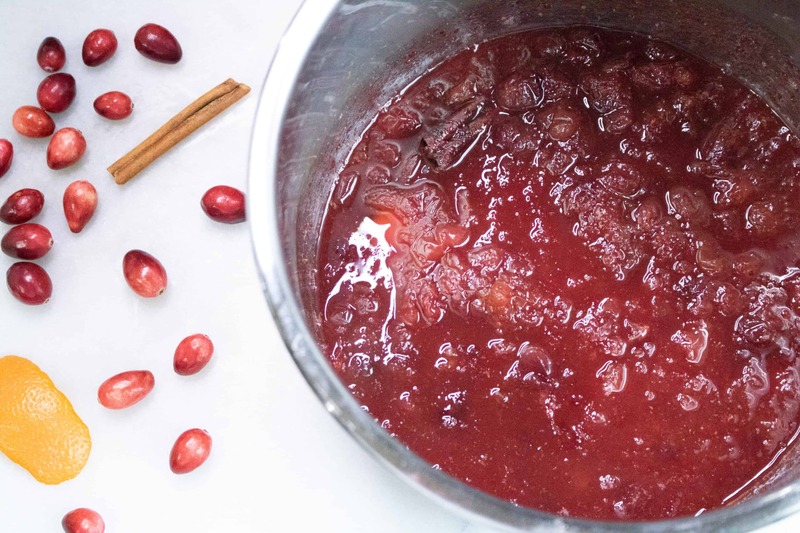 Make delicious homemade Cranberry Sauce in your Instant Pot! Combine all ingredients in the Instant Pot inner pot. Close the Instant Pot lid and turn pressure valve to the sealing position. Cook on manual high pressure for 6 minutes. Allow for a Natural Pressure Release for 6 minutes, then perform a Quick Pressure Release to let the remaining pressure out. Mash the cranberry sauce lightly before transferring to a serving dish. please note: cook time listed does not include time needed for pressure to build and to release.